In this electrifying new HD download series, Magic Man shares two of his favorite rubber band routines. These are two real-world routines that he has been performing for over 20 years - refined and tweaked through thousands of performances in every environment possible! These are real world, in-the-trenches routines that have been audience tested and perfected! "Magic Man turns the Boomerang Band into an absolute gem of an effect - this is a crowd gatherer that you will use!" "Exceptional, forged in the fire, real world routines!" 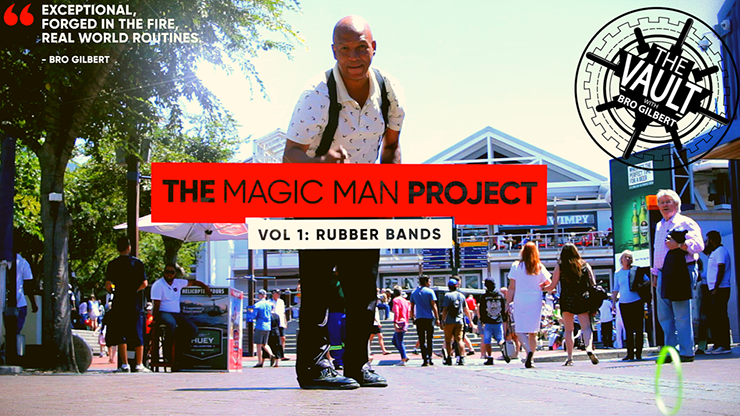 "I recall seeing Magic Man busk at the V & A Waterfront in Cape Town years ago...his presentation of the Boomerang Band is something I have never forgotten! I'm glad he is finally sharing this routine with the magic community." Magic Man is one of South Africa's best kept secrets. Magic Man has been touring North America, Canada and Asia for the past 20 years building an impressive list of achievements. From the Rolling Stones at the Sticky Fingers restaurant in London to the wrap-up party in Vancouver for U2's Zooropa Tour, Magic Man has entertained the finest! He has worked at the Edinburgh Festival and headlined at top nightspots across Europe, Canada and South Korea. Combining unbelievable sleight-of-hand with his unique sense of humor, Magic Man can keep any room enthralled with wonder for hours! Download the video and start learning from Magic Man!